After the death of dozens of pets, Delta Air Lines announced this week that it would no longer allow pets to be flown in the cargo hold of its passenger planes. "Delta will no longer accept pets as checked baggage, but will continue to transport allowable pets in all cabins of service except Delta One, effective March 1, 2016," the company said in a statement. "Customers may also ship pets for travel within the United States as freight through Delta Cargo." According to MarketWatch, 74 pets have died on Delta flights in the past 10 years, more than on any other airline, and 14 have gone missing. The announcement is a big step forward for pet travel safety, as flying has long been a hurdle for pet owners. Many airlines require pets be transported in cargo, where they're subjected to extreme temperatures, pressure drops and stressful noises and other stimuli. According to Bloomberg, 45 animals were killed, injured or lost on U.S. airlines in 2014 alone. While it still doesn't appear that Delta will allow large pets in the cabin of its planes, it does give pet owners the option of Delta Cargo, which the company says is safer. "Pets that are transported via Delta Cargo are monitored closely by customer service teams during their travel," Delta said. "While at airports, pets are handled in temperature-controlled holding areas and vans. Also, Delta Cargo enlists professional kenneling services if overnight stays are required." The company will still permit members of the military with active transfer orders or people with service or emotional support animals to check their pets as baggage. 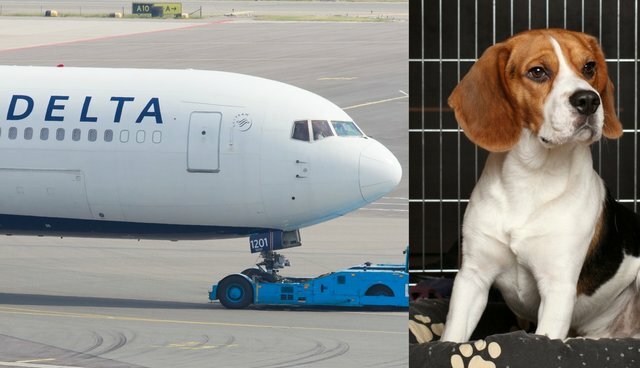 "Many of us at Delta are pet lovers and we know that they are important members of the family," Bill Lentsch, senior vice president for airport customer service and cargo operations, said in a statement. "This change will ultimately ensure that we have a high-quality, consistent service for pets when their owners choose to ship them with Delta Cargo."